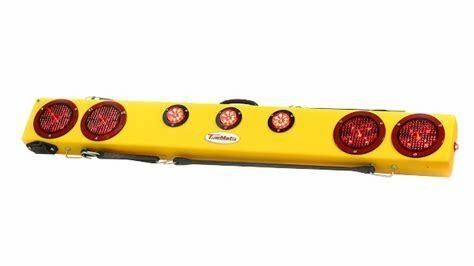 48" wireless truck bar system provides stop, tail, and turn w/ side marker lights on each end and three DOT lights in the center of the bar. This system comes complete with a 7-pin truck style transmitter and a 7-pin plug to be used to connect 12VDC power to recharge the truck bar. Plug the transmitter into your truck. Flip the ON/OFF switch on the unit to turn it on.